Four drip lines coming off a 1/2" tubing header. A setup using shut off valves and mounting clamps. Using a 1/2" tee with two soaker drip lines. 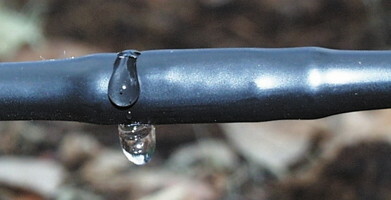 Attaching a soaker drip line with a transfer barb. How to use Tees and Elbows with raised beds. This is our easiest and most versatile kit to use and is great for short rows, small or irregularly shaped garden beds, and square foot gardening. 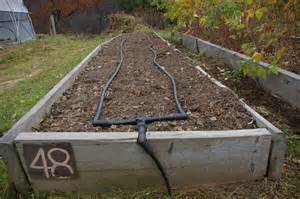 There is enough tubing and drip line in this kit to water three 4' x 8' raised garden beds with four 8' soaker drip lines each. Setup is a snap! Just punch a hole in the mainline tubing. 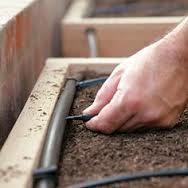 Attach each soaker drip line with a transfer barb and push it into the hole. End each line with a goof plug. 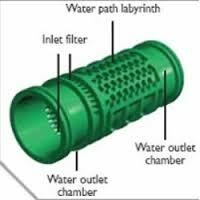 Each emitter is spaced six inches apart with two outlets each, the bending radius is one inch minimum, and the maximum length of drip line per row is 14 feet. For best results your barrels should be elevated at least four feet off the ground to maintain the minimum requirement of 2 psi. when the barrel is less than 3/4 empty. Otherwise you can elevate it just 3 feet which will help maintain some of the pressure when the barrel is less than full. 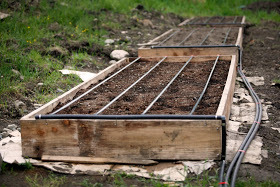 If you are raising your beds one foot or higher, the base of your barrels should be at least three feet above the highest point in your garden to maintain the extra pressure you need when redirecting the tubing up and over your beds. If you maintain the pressure of 2 psi and use 100 feet of Soaker Dripline, each emitter (200) will produce .16 gph or 32 gph total. That said, how long your water lasts depends on how long you leave your spigot open. To ensure that you have enough water for the time set, we recommend using a 275 gallon tote or a system of at least three rain barrels for this irrigation kit. 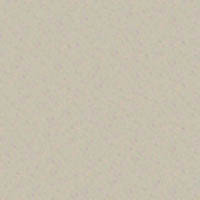 Here is where experimentation comes in. Set your timer for 15 minutes, then test your soil to see if that was enough time for the water to reach your plant's root system. Adjust the start time(s) and duration accordingly, based on your results. How long your water actually lasts depends on your setup (number of emitters, soil condition, height of barrel(s), type of spigot, length of tubing, timer use, etc.). 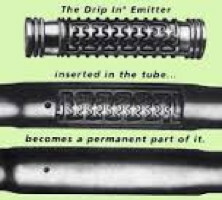 These inline cylindrical drippers, spaced at 6" intervals, are clog resistant and self cleaning thanks to inlet filters and labyrinth passageways.